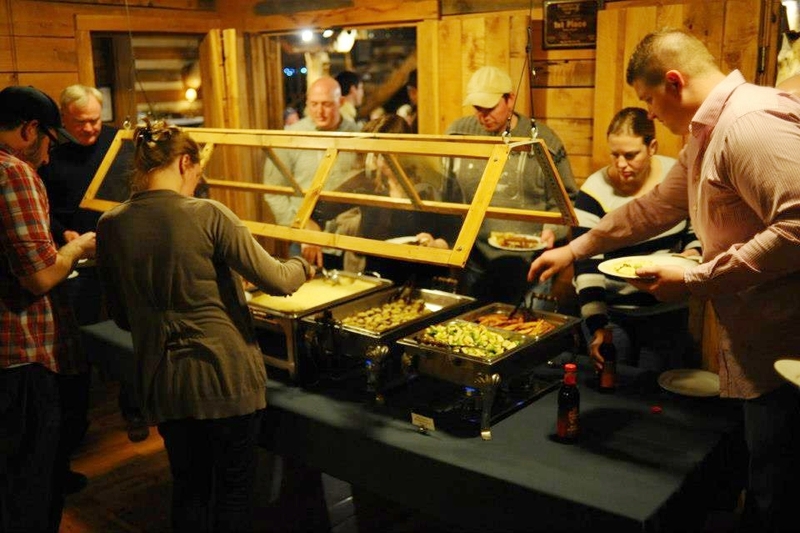 With a can-do spirit and a love for sharing meals, Wilderness Adventures Dining Options are built to reflect your unique adventure! When designing your retreat, choose from any or all of these options! The Classic WA-style buffet features fresh, hearty ingredients for breakfasts, lunch, and dinners! You can expect a hot American breakfast with bacon or sausage, pancakes, etc. For the fine dining experience, choose from suggestions or let us know your preferences for meals. Prepare meals on your own! The best Lodge for cooking is SLY Lodge - which has a full kitchen and kitchenette. Other options for bringing your own meals? Picnic areas, camp grills, and kitchenettes (feat. mini-fridges, coffee makers, microwaves, & toasters) are available with all building accommodations. Rent camp stoves from WA, or use some of our camp grills for food when camping. Or, check out some of the options within a 30 minute drive: For a great sit-down try The Homeplace, Ballast Point Brewery, or the Tap House. For some of our staff's favorite New Castle options try Bibo's (who deliver to WA! ), Pine Top, Subway, and the fried chicken at Food Country USA! Is there a Menu we can see before we arrive? There's a restaurant there, right? Not exactly. WA has a full-service kitchen to prepare meals for groups of 8 or more! If you're with a group smaller than 8, and there is already a meal service scheduled for another group, you may be welcome to join that service! Reservations are required, some groups may have arranged for private dining - in which case we might not be able to have you join. I'm Gluten-Free/Have a Peanut ALlergy/Lactose Intolerant/ETC., Will there be something I can eat? We are happy to accommodate dietary restrictions and food allergies so long as we have a head's up! Let us know 2 weeks before your group arrives, and we'll be sure to have the best ingredients to make you feel comfortable! In the rare instance that we cannot provide full meals accommodating your diet, we will let you know and recommend you bring supplemental options that can be prepared with microwaves, toasters, or eaten fresh. We do have refrigerators and space to accommodate guest's food. MY PEANUT/Gluten/ETC. ALLERGY IS SEVERE, DO YOU ALL HAVE EXPERIENCE WITH THAT? We sure do! Whenever we know a guest with a severe allergy to peanuts or any other food item is coming to WA, we make all arrangements in order to prevent cross contamination and airborne contact with allergens. This means we'll remove peanut-butter completely from our kitchen, make a separate entirely gluten-free plate for someone with Celiac disease, or remove ingredients containing the allergen completely from any dishes served. You bet! A drink station with water, tea (Miss Amy's Sweet Tea, to be exact), and lemonade are available at Lunch, Dinner, and throughout your stay in the Main Lodge. At breakfast, we serve water, hot tea, juice, and coffee. Those opting for Premium meals can expect to enjoy freshly roasted coffee from Mattie's Mountain Mud - an artisan roaster just a stone's throw from WA! Alright, let's get down to it: What's the Dessert situation? Dessert is included with any Dinner at WA! If you're only here for Lunch, we'll try to include it in your meal. Common WA desserts include cake, cookies, ice cream, and -of course- s'mores! Can I make a special Request for a meal? We would be happy to work with you to create a menu based on your interests - however, please be aware that this may increase the cost of you dining services. If you have a special request, please be sure to contact us at least 2 weeks prior to your retreat! If there's a birthday being celebrated while your group is here, we'd be happy to provide you a simple sheet cake & candles!